Our wildlife expert Ed Andrews finds out how conserving ancient floodplains can lead to richer habitats for animals and wildflowers. As you read this, the hay-cutting season will be underway around Shropshire. When skies are blue, farmers will be out cutting, turning and baling the golden, sweet-smelling hay to use as winter feed for their livestock. Meadows will have been left ungrazed since spring to allow grass to grow long and lush. This is an age-old method of managing grasslands and has created a valuable habitat, as a good hay meadow can be home for delicate wildflowers. Hay meadows on floodplains are a particularly scarce habitat with a unique flora. The most famous example of a floodplain meadow is North Meadow National Nature Reserve in Cricklade in Wiltshire. For many years this site has fascinated and enchanted me from afar but, in May of this year, I paid my first visit. 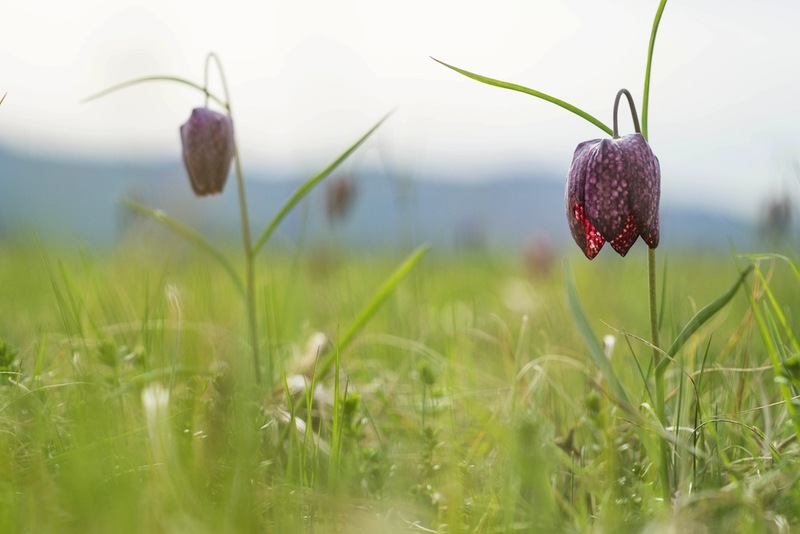 North Meadow is synonymous with one type of plant, which exists in incredible abundance; the snakeshead fritillary is more commonly seen today in gardens but at Cricklade it grows wild. The drooping flower heads are chequer-patterned and look as though they have been dipped in red wine. Individually the fritillary is exquisite; collectively the 500,000 plants make North Meadow glow a deep crimson through late April and early May. It is as if the field has been studded with sparkling rubies. North Meadow is bordered on two sides by Rivers Thames and Churn. The seasonal flooding creates unique soil and hydrological conditions and allows the snakeshead fritillary to thrive. It is believed that 80% of the entire British population is now found at North Meadow. Floodplain meadows like this were once a common habitat across the UK. Today the total area of floodplain meadow remaining is about the same size as Heathrow airport. The loss of our species-rich grassland is a forgotten story of abuse, mismanagement and neglect. My visit to North Meadow was part of a training course for floodplain meadow ambassadors, with the aim of gathering research and raise awareness about the habitat. North Meadow has not been ploughed or fertilised, meaning the site has become extremely species-rich. It is an example of a Lammas meadow – in mediaeval times, these were divided into strips (or ‘lots) and people could bid for the hay crop from each strip. We discover a lichen-encrusted stone set in the ground with letters engraved; these stones demarcated the lots. After the hay was cut, the meadow was grazed communally, with animals nibbling away on the fresh ‘aftermath’ growth that follows the hay cut. The Court Leet still meets in Cricklade to preside over the meadow and ensure it is cared for, emphasising the cultural heritage that underpins this site. Along with my colleagues, I take soil samples, measure the groundwater level and record the species of plant. In some metre-square plots we count upwards of 20 species. On the way back from site I call into a local shop to buy some water. The lady who serves me spots my clipboard and wildflower guide and immediately starts telling me her own story about the meadow, describing how the most recent flooding has prevented her walking around the site as much as usual. I also discover that each year the ‘Fritillary Tearoom’ sets up in town. Volunteers serve tea and cake to the 400 visitors a day who come to see the meadow in bloom. The meadow is clearly an important part of Cricklade life. Through the 1800s, the Enclosure Acts enclosed common land with fences to enable landowners to charge higher rents for land. The way North Meadow is managed harks back to a time before the Enclosures, when land was managed communally. Fences are both a physical and psychological barrier; the commons approach to managing land encourages people to make their own connection with ‘their’ land, and that connection it still strong today at Cricklade. The best local example of a floodplain meadow is Mottey Meadows National Nature Reserve near Wheaton Aston. Who knows how many other local floodplain meadows have been lost through agricultural ‘improvement’…? Just north of Telford is a flat area called the Weald Moors. These were once peaty moorland and wet grassland, but they have slowly been drained, enclosed and brought into production. The owners of Wall Farm near Kynnersley are trying to reverse the damage by re-flooding fields using a windmill. As part of the ambassador programme, I will be studying this planned restoration for the next couple of years. I hope that this can highlight how managing this precious habitat can benefit both farming and nature conservation. For meadows to be saved, they need to be understood and appreciated. This month, why not celebrate hay cutting season at a Meadows Day near Stiperstones? The event, on Saturday 9 July between 11am and 5pm, will include will be wildflower walks… you can even have a go at hay-cutting the old way, with a scythe.